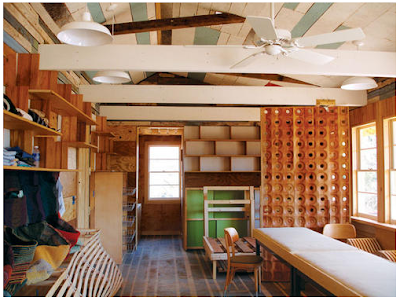 As somewhat of a pack rat with a curator's desire to display, I was quite taken with the interior of this shackitecture studio built by the Auburn University Design Build Masters program. I am certain that the students building this delightful studio learned more through the process than all previous college instruction combined. For those architects and city code experts out there, we at D+R have a few shackitecture related questions. We have heard that it is against code and illegal to utilize used lumber. Is this a fallacy? Does that restriction only apply to structural wood? Does a building under 100 square feet require a permit? 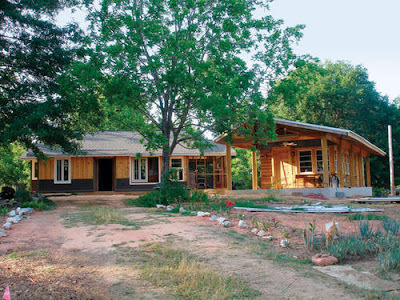 What would keep an individual from building 2-3 100 square foot shacks? Are there restrictions on what can be in a 100 square foot shack, like no bathroom? Mobile homes are exempt from building codes, correct? As such, could you buy a mobile home and strip it to a skeleton and use this as a basis for building a code-free shackitecture project? Having dealt with building inspectors, I am extremely motivated to never work with them again. It is not that I am against uniform building code, I am just opposed to the inspection process. Admittedly, when I buy a brand new building or walk into a skyscraper, I am thrilled that they have done their job and it is a necessary mark of civilization. However, as an individual who has been through the process, I can tell you it is very arbitrary and completely dependent on the individual inspector's predilections and quirks, which sometime slip into malicious power wielding. Don't believe me? Wait until you have an inspector measure the height of the handicap restroom sign to the ground and declare it an inch too low. What is shackitecture? Buildings of modest size and grand ambitions.